“The Galileo Seven” is an episode I remember well, because it was one of the ones I had as a Bantam Fotonovel way back in the day when I was a kid. I think of it as a strong and dramatic episode, though perhaps that might be tinged with nostalgia. The first thing to notice about this episode is that the Enterprise is investigating the Murasaki 312 quasar. Now, having studied quasars for my Ph.D., I know quasars are enormous and enormously powerful phenomena generated by supermassive black holes at the centre of galaxies. They are not something the size of roughly a solar system that you can fly up to and inside and take scientific readings of with a starship of the range of the Enterprise. Of course, nobody knew that back in 1966 when this episode was made, so that’s forgivable. In fact the idea that they were relatively small, close objects similar to what we see in this episode was still scientifically supportable at the time. So no real criticism, but it is odd to see. Immediately following this plot revelation, we are treated to our first view of one of the Enterprise shuttlecraft, the Galileo, leaving the hangar bay in a majestic scene (albeit a majestic 1960s special effects scene). On board are seven crew members: Spock, Scotty, token Yeoman Mears, Lieutenants Latimer, Gaetano, and Boma, and Dr McCoy. Wait… what? What is Dr McCoy doing on an expedition to scout an astronomical phenomenon? I guess he’s there in case the shuttlecraft shakes from side to side and someone bruises an arm. In plot terms, he’s there to be a foil for Spock’s wrestling with the difficulties of his first command, by arguing for human emotion over Vulcan logic, but that’s hardly a mission role. And this is all before the opening credits! Anyway, the Galileo ends up stranded on a desert island planet in the middle of Murasaki 312, which conveniently blinds the Enterprise‘s sensors so that they can’t find them. What’s more, they’re on a clock, because they have to deliver a shipment of plague-curing drugs to Makus III before a deadline when they’ll be sent on to a plague-ridden colony, as Kirk is constantly reminded by Commissioner Ferris, who may be the single most smarmy and annoying character in the entire series. Frankly, I’d have paid good money to see Kirk rip his shirt and take Ferris in a fist fight right there on the bridge of the Enterprise. Things are grim on the planet, with only enough energy to take off with 4 people on board. Spock says the decision of who to leave behind will be his. He then orders the expendable Latimer and Gaetano to scout the area, staying in visual contact with the shuttlecraft. They immediately wander off past some rocks that block their line of sight and encounter an eerie fog. Latimer gets skewered by a positively enormous spear with a stone head – the stone spear point alone was about the size of a large turkey. Investigating, Spock remarks that the spear point is similar to the Folsom points of Earth, although to me it looks much more like a Clovis point. Spock orders the ever more expendable Gaetano to remain on guard near the spot where Latimer got spiked. Back in orbit, we see a shot of stars streaking past the Enterprise, despite the fact that it’s in orbit about a planet, so stars shouldn’t be going anywhere with respect to it. Meanwhile, back on the Planet of Doom, Gaetano is approached by a giant hairy ape-man in classic zombie arms-out-in-front pose. Sorry, the poor late Gaetano. Scotty has been working full steam on reconfoogling the Galileo to run on the power from the phasers, while Yeoman Mears has been doing nothing but appearing in soft focus shots and being terrified. There’s some drama involving Boma being insubordinate to Spock behind his back, to the approving nods of McCoy, over Spock’s use of logic treating people as mere objects. 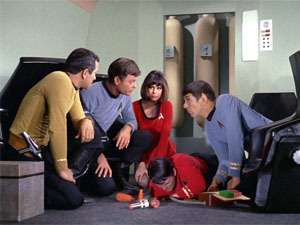 Before lifting off, Spock allows 10 minutes to bury Gaetano (and presumably Latimer) – I’d like to see any gravedigger work that fast – if the hostile natives will allow it. Eventually they take off, with all five remaining passengers thanks to lightening the shuttlecraft, with just enough fuel to make one orbit. Although by this time Commissioner Ferris (booo!) has ordered the Enterprise to depart for Makus III. Spock’s “illogical” reaction is to dump and ignite the fuel, producing a flare that the Enterprise can see. But without fuel their orbit decays and the Galileo begins to burn up on re-entry – though why it didn’t burn up the first time it entered the planet’s atmosphere without any power is unexplained. Yeoman Mears finally provides a reason for her to be in this episode, with the observation that “It’s getting so hot!” But the Enterprise is on hand and beams the survivors on board just before the Galileo becomes slag. Yeah, actually not as bad an episode as I make it sound. It has drama and tension and shows Spock in a new light. It’s really the first Spock episode, with Kirk having relatively little to do. If only he’d punched Ferris’s lights out it would have been a great episode. Body count: Latimer, Gaetano, landing search party member O’Neill (killed off-screen). Tropes: Science Marches On, Negative Space Wedgie, Readings Are Off The Scale, Cold Equation, Ominous Fog, Streaming Stars, Zombie Gait, Gaussian Girl, No One Gets Left Behind, Captain Obvious, Everybody Laughs Ending. This entry was posted on Monday, 18 October, 2010 at 20:16	and is filed under Star Trek. You can follow any responses to this entry through the RSS 2.0 feed. You can skip to the end and leave a response. Pinging is currently not allowed.